According to Fabiano Farah, Vitor Belfort’s representative, the former middleweight top contender will not be afforded a tune-up bout before getting a shot at the 185-pound title in November. 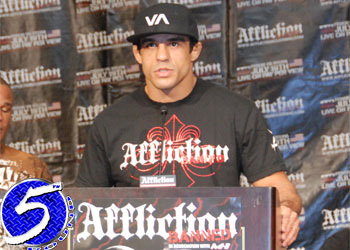 “Vitor will be in (the best) absolute physical condition to return to the Octagon and fight for the UFC title by November 2010,” Farah wrote today in an email to MMAJunkie.com. There are currently no UFC events rumored for November. Champ Anderson Silva was expected to face Belfort at UFC 112 last month in Abu Dhabi, however the former UFC light heavyweight champion was forced to pull out of the highly anticipated bout in February due to a shoulder injury. This September will mark a year since Belfort posted his devastating UFC 103 knockout victory over Rich Franklin. Despite the threat of fighting ring rust in addition to Silva, Team Belfort was unwilling to take a warm-up bout before jumping into a 5Round affair. Following Silva’s “embarrassing” display at UFC 112, president Dana White immediately assigned him a no-nonsense challenger in Chael Sonnen. Not only will Sonnen refuse to kiss Silva’s lethal feet like other adversaries, but he can’t stand “The Spider,” so the champ may actually be tested for a change. Silva and Sonnen are slated to headline UFC 117 on August 7th inside Oracle Arena in Oakland, California.